Traditions start with the simplest gestures. 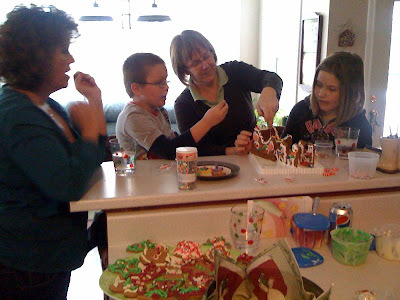 Last year, my friend Linda invited two little friends from school to her home to make a gingerbread house. The invitation was made by Linda in the hopes of brightening up their Christmas and also her own. Some families have nothing, not only materialistically (if that's a word) but also in spirit, traditions, and values. Linda wanted to share some of her traditions with these little ones who haven't done very much with things like bake cookies, spending afternoons listening to Christmas music, making decorations (other than at school) and writing letters to Santa. 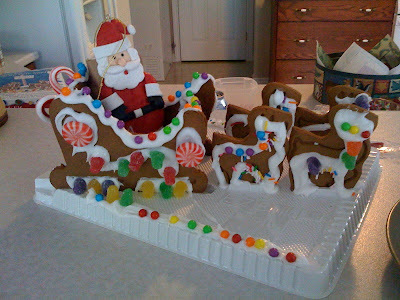 Linda invited me along for the fun, and she bought one of those gingerbread house kits for us to put together. It was a great day, full of mess, chatting, licking of fingers and gobs of candies stuck in weird places. Well, this year, in late November, the kids went to Linda's office to see what day they were coming over to make cookies, etc. And voila, a tradition is born! This year, instead of a house, Linda bought a sleigh kit. 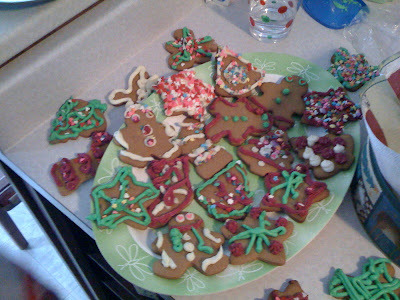 Also, this year, Michelle was home for this event, and she made a batch of gingerbread cookies, and three kinds of icing. She put them in piping bags, and the kids went NUTS.!! What a fun day... and there was lots of finger licking, and candy stealing and Michelle made 12 or so little stars for "sampling" and they got decorated and eaten throughout the process. 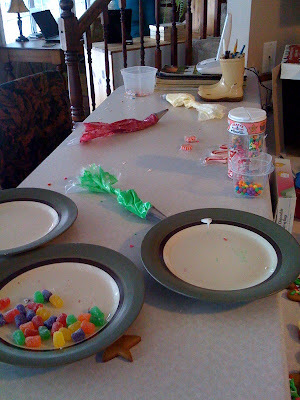 We left Linda's house quite colorful... with icing stains, sprinkles and round hard candies deposited in the funniest places (not on purpose!). You can see a little gingerbread star hiding under the plate. 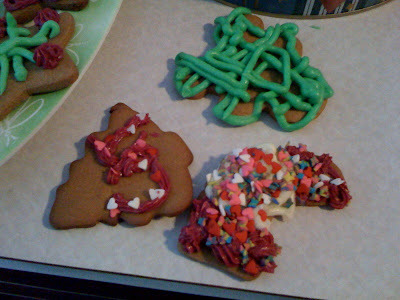 It was discovered during clean up, promptly decorated and eaten! Thank you to Michelle for her wonderful cookies, and to Linda for inviting us over for this newborn annual tradition! I am not quite sure if they got the sleigh home all right, but the cookies were safely stacked in several Christmas cans to be given as gifts for mom, and grandparents. What fun for these 2 special children and for the 3 adults involved too. You and Linda have made such a difference for these 2 children and have helped to create special memories and traditions for them that they can hopefully carry on into their futures. How thoughtful you are!!! You and Linda have done a wonderful thing for these children... and Michelle has added to the fun... they will never forget these wonderful memories. Hope your Christmas was very Merry and I wish you a Happy New Year! !